We have a kind of survivalist instinct, that kind of humour that comes from surviving and clinging onto something It gives you an edge, it gives you an energy, it gives you emotion and passion in the stuff produced here that you don't see in Toronto. It is often said that the best comedians are Jewish, black or Irish. They have experienced adversity and discrimination, and they use humour as a means of coping. It is for this same reason that Canada is blessed with a treasure trove of Newfoundland comedians. There is little doubt that Newfoundland has borne more than its fair share of hardship. With its history of harsh weather and unemployment in the fishing industry, the people of the province have learned to struggle against adversity. In his 1982 book, In Search of the Newfoundland Soul, Cyril Poole describes how climate has shaped the character of Newfoundlanders. Because we have not been able linguistically to slay our enemies, fog and rain, sleet and snow, we must each day go forth and do battle with them. And the battle has moulded our character. Newfoundland humour is also derived from the province's unique brand of oral stroytelling. Many Newfoundlanders are of Irish descent, and of course, the Irish have a rich history of oral tradition. But aside from having a different view of things, Newfoundlanders generally don't regard hmour as something that needs to be written. It is something that is an oral happening, in the form of a particularly imaginative piece of swearing, a spontaneous witticism or a fabricated tall tale embellished according to the taste of the teller. According to Robert Moore, a native Newfoundlander and a physics professor, word play is learned at a young age in the province and the following example is popular among its children. "If they are blueberries, why are some of them red?" Given this background, it is no surprise, therefore, that Newfoundlanders have been such successful television comedians. I am a devoted fan of CBC comedy shows such as The Rick Mercer Report and This Hour Has 22 Minutes. The preponderance of Newfoundland comedians on CBC, however, really began with a show called CODCO. CODCO (an abbreviation for Cod Company) was a comedy troupe of Newfoundlanders who reflected the province's history of self-deprecating humour and satire. The group performed at the Fisherman's Union Hall in St. John's during the 1970s. An active theatre troupe from 1973 to 1976, CODCO toured throughout Newfoundland and Labrador and in manor Canadian cities. They also travelled to the United States and England. An example of their humour: they claimed to have formed the "Cod Peace Movement" for the purpose of protecting poor, helpless cods from the brutality of barbarian seals. CODCO was eventually given its own television series, which aired on CBC-TV from 1987 until 1992. The show's comedy consisted largely of satirical sketches and social and political commentary. Some of its recurring characters included a talk show host with terrible guests and a couple of lost souls who ride the bus because they can think of nothing better to do. 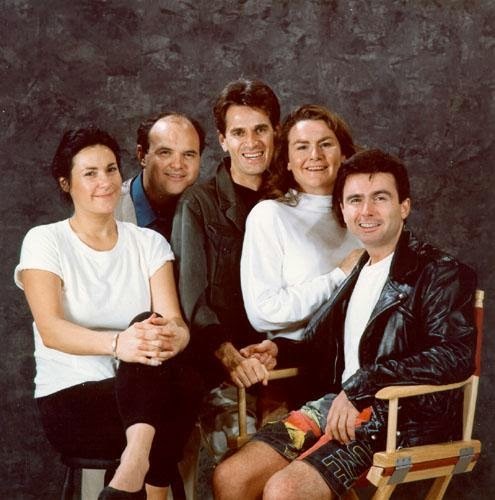 Below is a publicity photo of the CODCO cast - L to R: Cathy Jones, Andy Jones (Cathy's brother), Greg Malone, Mary Walsh, and Tommy Sexton. In 1993, the highly successful This Hour Has 22 Minutes was launched. 22 Minutes originally featured Cathy Jones, Rick Mercer, Greg Thomey and Mary Walsh - all Newfoundlanders. 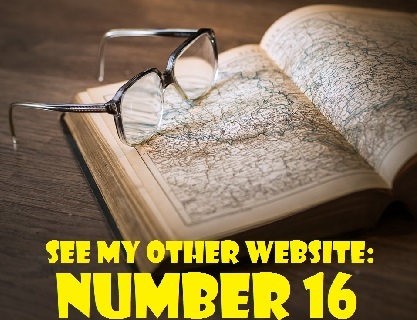 It is a fast-paced and humorous look at Canadian and international politics and events. 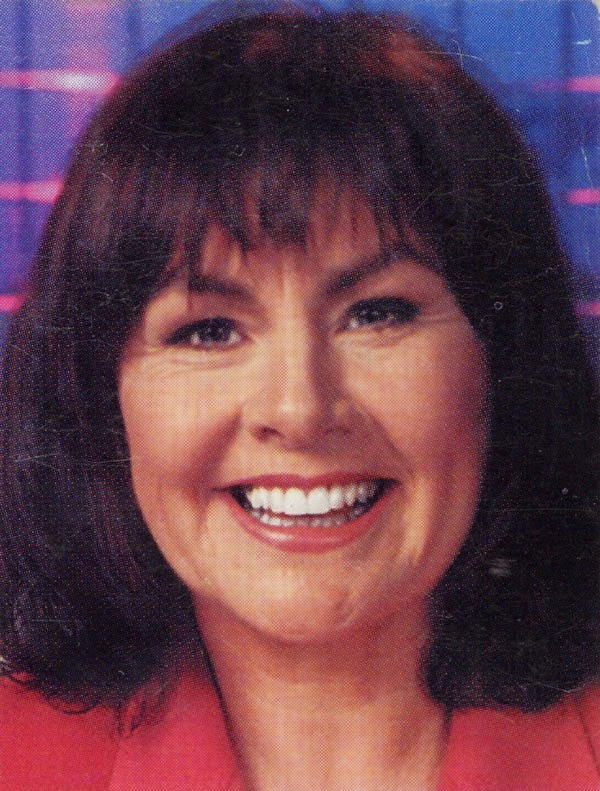 The series was created by Mary Walsh, who departed in 2004 to pursue film roles and to host Mary Walsh: Open Book, a discussion show about books and literature. She has returned for guest appearances. 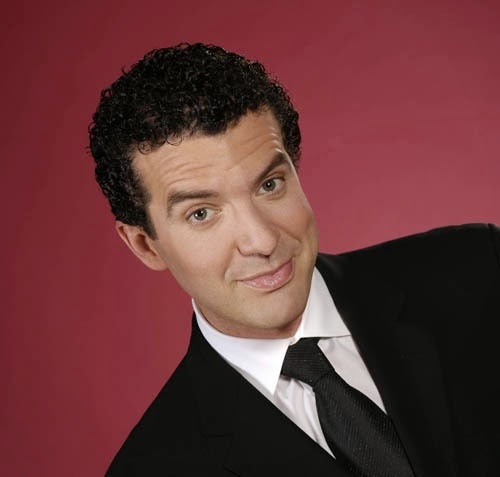 Rick Mercer left 22 Minutes in 2001 to spend more time on another CBC show he was doing at the time, a satire about the Canadian TV production industry called Made in Canada. 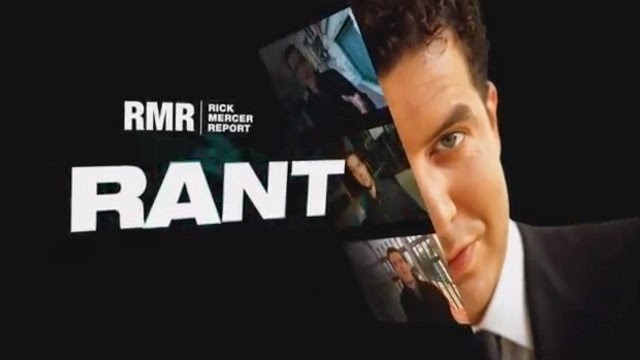 After Made in Canada went off the air in 2003, Rick became the host and star of Rick Mercer's Monday Report, now known as The Rick Mercer Report. While a member of the cast of 22 Minutes, Rick began performing his popular "rant" in which he walks briskly while making scathing social and political comments. "Rick's Rant" is now a regular segment of The Rick Mercer Report. On 22 Minutes, Mary Walsh's character, Marg Delahunty, became known for ambushing politicians and other public figures, forcing them to undergo her fearless questioning. She would confront them with criticism and motherly guidance, and some of them would squirm uncomfortably at her acerbic remarks. 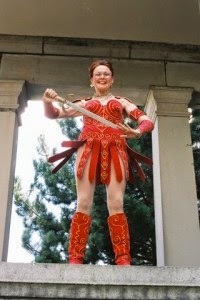 She frequently appeared in a bright red costume as "Marg, Princess Warrior" (a parody of Lucy Lawless' Xena, Princess Warrior character. On October 24, 2011, in a reprisal of her Marg, Princess Warrior role, Mary accosted Toronto Mayor Rob Ford at his home. Ford reacted angrily and allegedly hurled verbal abuse at a 911 operator. The incident made news headlines and Walsh was criticized by some for showing up at he mayor's home. Mary, however, denied she was trying to upset Ford, who apparently did not recognize her. "I'm a 60-year-old woman with a plastic sword, "she declared. "I was only going to give him a bit of friendly advice." This Hour Has 22 Minutes is still going strong, with Cathy Jones the only original cast member remaining. The rest of the current cast consists of Mark Critch, Sean Majunder and Susan Kent - all Newfoundlanders. 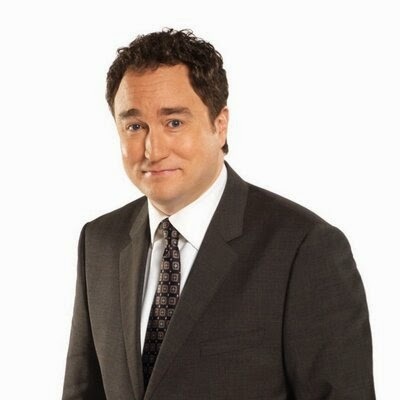 Mark Critch, was born in St. John's in 1974. and began doing sketch comedy when he was 15. 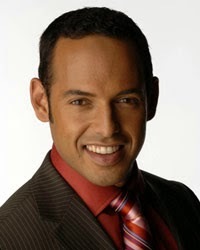 In 2003, he moved from being a 22 Minutes writer to being one of its permanent anchors and reporters. He is a talented and hard-working comedian. On the show, he has done spot-on impressions of singers such as Burton Cummings and Neil Young. He has a great knack for imitating their mannerisms and their singing voices. Mark has appeared in CBC's Winnipeg Comedy Festival and hosted the Halifax Comedy Festival. He has also written for and appeared in CBC's popular Just for Laughs series. However his talents are not just limited to comedy. He has played the role of Ned Bishop in the CBC's detective series Republic of Doyle and a Gander, Newfoundland airport radio man in the 2006 World War II mini-series Above and Beyond. In 2013, Critch won the Best Actor Award at the Atlantic Film Festival for his performance in the Newfoundland-themed comedy The Grand Seduction. In the much-acclaimed movie, he portrays a branch bank manager Henry Tilley, a resident of the small harbour community of Tickle Head, Newfoundland. For 22 Minutes fans, the film is a must-see because Cathy Jones and Mary Walsh also have roles in it. Sean Majunder is a native of Burlington, Newfoundland. He was born on January 29, 1972 to a mother of European background from Newfoundland and a Bengali Hindu father. A stand-up comedian, Sean first joined the cast of 22 Minutes in 2003. He is probably best known for his portrayal of a character named Raj Binder, a nervous, bespectacled Indian reporter who sweats profusely. Sean also stars in a show entitled Majunder Manor. It's all about his attempts to turn his picturesque hometown of Burlington, Newfoundland into a tourist haven. The tiny hamlet is located on the east coast of Newfoundland on Notre Dame Bay. It's a small lumbering and fishing community with a population of about 349 people (2011 Canada census). Sean Majunder has been married to American actress Shelby Fenner since December of 2012. Shelby, who was born in Petoskey, Michigan, is known for films such as Vantage Point (2008), Wolf Girl (2001) and The Guardian (2006). Susan Kent, the most recent addition to the cast, is an actress and writer from St. John's. She started working in TV in 2005 when she played the role of Darlene in CBC's Hatching Matching and Dispatching. She became a member of the 22 Minutes team in 2012 after being a writer and guest performer for the show. By the way, on October 22, 2014, This Hour Has 22 Minutes will begin its 22nd season.